Description: Trunk to 12 m high, to 15 cm diam., patterned with ovate scars where stipe bases have shed cleanly; stipes yellowish brown to brown, warty, the bases deciduous, scales of the stipe base of two kinds, pale and 2–5 cm long and 0.5–5 mm wide, and inconspicuous red-brown scales 0.5–1.5 cm long and to 0.5 mm wide. 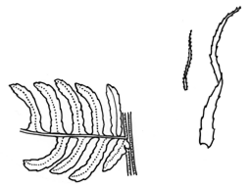 Fronds to 5 m long; stipe to at least 50 cm, the warts brown and to 0.5 mm high; lamina 3-pinnate at the base, green above, paler below, ultimate segments toothed in upper half. Sori bearing a ring of scales. Distribution and occurrence: in gullies in warm coastal rainforest; north from Durras Mtn. Other Australian states: Qld *W.A.